He had come to her like a dark mist, hovering before finally settling. He said nothing but her name;a name her mother had given her. A name this half-breed cared little for. Names were just labels, it seemed. Lifting her head from her paws, she stared at the lanky male with her multi-colored orbs, stoic. But deep inside, there was an ocean of emotions; the waves churning and tossing and twirling. She searched his eyes for any emotions, too. Was he still angry at her? If she asked him to take her away from this place, would he do it? She wasn't sure. He was just like her. He hid it all too well. She gulped. I'm so sorry. She wanted to say, because she was. She was a dificult she-pup to care for, and yet after scolding him so much, he still found his way over to her. Her heart burst like a dam, and she crawled forward, burrowing her muzzle into his neck fur, breathing him in. She just snuggled in closer, grey fur mixing in with black as her eyelids closed shut. "Don't be cross with me.." She whispered, just for his ears, shuddering just once. Mave noticed that the female seemed to be relaxing a little bit more about his presence. He nodded when she told him that her name was Niko. "Nice to meet you too, Niko. Are you looking to join this pack?" It was just then that he noticed that Verine had come back. She didn't pay attention to anyone and just kept to herself; it was plain she was still shattered. Mave sighed, and decided that he would talk to her after he was done talking to Niko. "Greeting Jeamesero and company." A new wolf said as they walked in. Motomo looked at him, he had two wolves with him. One had strange coloured eyes and the other looked shaggy and had black fur. "Do any of you know where the Alphas are? I found a wolf who wants to speak with them, says he's been here before, yes?" He said. Motomo looked at him, this wolf was acting as though he'd been here for a while, probably like Jeames seemed to have been. "Stay down and watch in the background for now." He thought, backing away from Jeames and to the sidelines. He looked towards the other wolves who were there, wondering what'd happen next. "Hello there. Currently Veri is off by herself, and I don't know where Cass is at the moment. 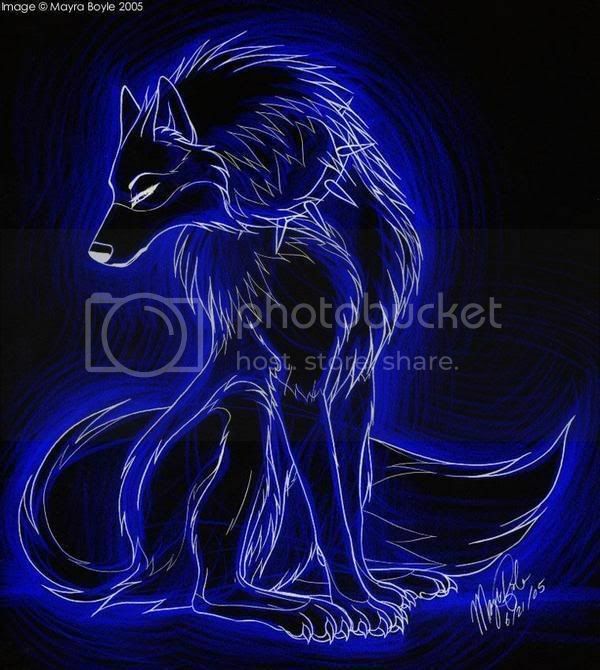 As being the former alpha, I think it's safe to say that it's appropriate to speak to me, though you may wait for the current alphas to return if you so wish," Another wolf, with strange markings, said. He seemed like a former alpha, he was well informed of the area. Motomo just remained low, he didn't want to much contact with other wolves. Then the former alpha walked off towards a different wolf, addressing her in his own sort of way. "Hi there. Are you part of this pack?" He asked the wolf who replied quietly. "Hi there, are you part of this pack? Hi, yeah, I'm sorry, I didn't mean to intrude, I was in the area and just... sorry." 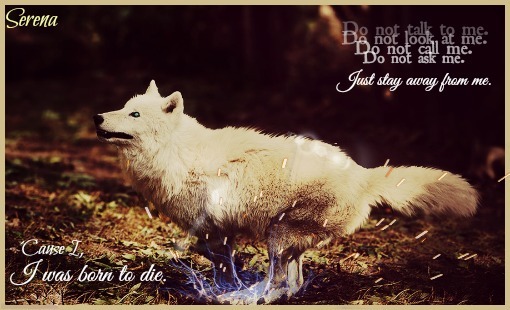 The wolf said. Momo decided to stop listening by now, he was bored. He just watched everyone. Addressed: x Mentioned: Jea, Mave, Niko Word count: 301 Notes: Finally rping Momo again, WHY CAN'T I DO LONG POSTS OMG I AM GOING TO EXPLODE. Niko did a double take. She replayed the words in her head. "Are you looking to join this pack?" Was this an offer? 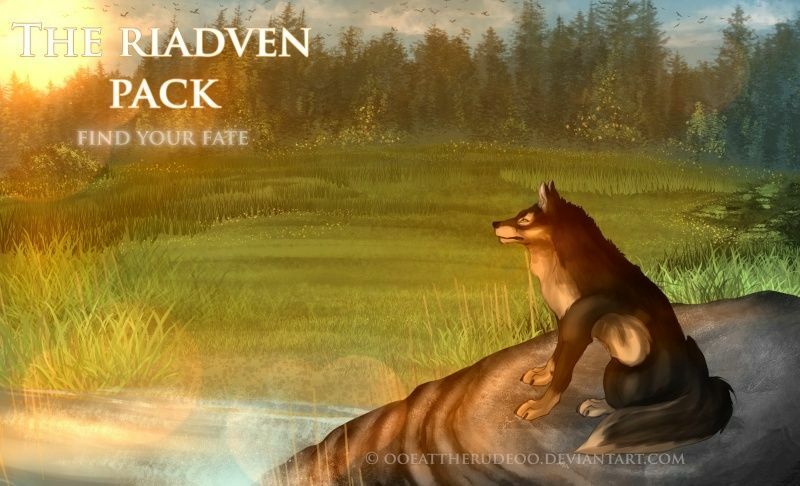 Was this wolf, Mave, offering her a place in the pack? Surely he couldn't be. It had to mean something else. Why would anyone offer a lone wolf a position in, what appeared to be, a highly organised pack. Niko, realising she had been sat in silence for a few moments, found her voice. "Actually, umm...yes. I was. It has been many moons since I was last in a pack." The memory of her past stung at her as she spoke. "Is there anyone I can speak to?" Mave seemed to have a relaxed look in his eye as she adressed him and this washed over her, making her feel safe. It was an odd thing, to feel safe, especially in the presence of so many unknown wolves. Her voice was soothing, yet her words were concerning. However, they did help him remember. The fight, the bear, the pups. Eyes widening for a moment, he'd tilt his head to each side, looking out for the rescued whippersnappers, yet the only tiny creatures he saw were laying lifeless on the ground. He could tell they were dead. Their eyes lost their pigmention, their bodies were not meaning, their lungs were not filling with dreadfully needed oxgyen. They were gone. A sigh exited his maw. He couldn't save them, couldn't help them. He failed. Just like he failed to find his brother. He let them down. Shaking his head slowly, regaining his control, he'd direct his amber irises onto the frame of the she-wolf in front of him. Kanaya. A tantalizing name. Her stuttering was sweet, if he wasn't put in such a deadly serious situation, he'd have smiled. But the events which occured not too long ago wouldn't allow that. His pupils slowly wandered down, from her face, to her chest until they reached the ground in front of him. Was he allowed to feel sorry? He couldn't imagine how their parents must be feeling in this very moment. Shadow wouldn't feel any pity. Pity would change nothing. Pity couldn't bring their childs back. No one needed it. As she questioned him if he was feeling 'okay', he slowly breathed out, once again attempting to stand up, successfully this time. He nodded, answering shortly “I'm good.” However, something else caught his attention, something quite peculiar; he did notice that this canine never tried to make eye contact with him. No. She rather did her best to avoid looking into his eyes. 'Quite odd..' He thought, yet it made him smile softly. This femme. She was so beautiful, the brute would've never seen anyone or anything that could match her beauty. “Thank you for asking, though.” He'd add to his previous sentence, his voice a lot smoother. Once the voice of yet another male caught his attention, he'd face this very wolf. The brute could not recognize this lupus, he never met him. Listening to his following words, Shadow's receptors would push themselves back, his face tilting to the opposite side, facing nothing but the trees. This wolf was talking about his brother... A slight growl exited his mouth, just a signal for everyone that this was a touchy topic. “My brother shouldn't be known as the wolf who has gone crazy after being infected by rabies.” His voice grey louder with each words “He is not a lapdog who needed to be put down! He was my brother and I'm sure as hell that he died in honor.” Snorting once, he tried to keep himself under control, even though it seemed to be impossible for this rather hostile carnivore. Seeing the Alpha being occupied with more canids not too far from their location, he did sigh once again. This was too much for one day. Too much death. Lupa looked up after Zara finished her prayer sort of thing and bowed her head in respect. She looked at her face but not her eyes so to not be intimidating and spoke in the softest voice she could: "Come, Zara, we should introduce you to the others." And without another word she turned around, Lupa could see a group of wolves be healed by the wolf that approached her as she arrived. Lupa watched the wolf chew up something in their mouth and put it on the wounds. She decided seeing them wasn't the best of ideas, though. 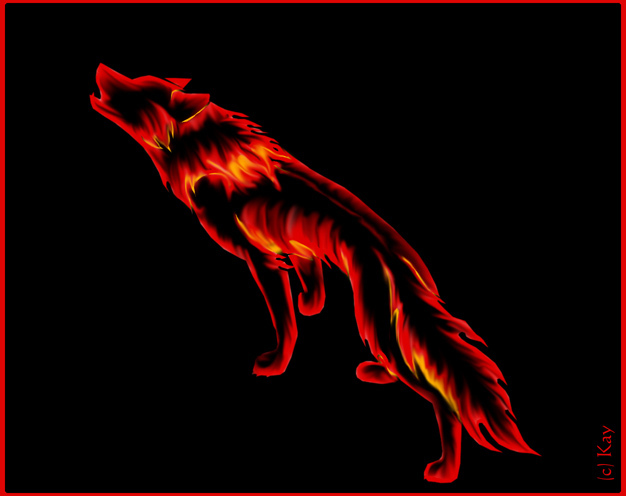 Lupa walked over to where Mave was before and there was a reddish wolf cowering in the corner and a black one laying on the floor and another standing just above the one on the floor. “My brother shouldn't be known as the wolf who has gone crazy after being infected by rabies.” The wolf said, Lupa was curious now, who was the wolf with rabies? “He is not a lapdog who needed to be put down! He was my brother and I'm sure as hell that he died in honor.” The wolf snorted, Lupa could tell he was trying to hold everything back so she got herself ready to make a move if this wolf did decided to make himself hostile towards them. “I am Shadow and the male you were referring to as 'Shadow' is... Was my brother, Dark." 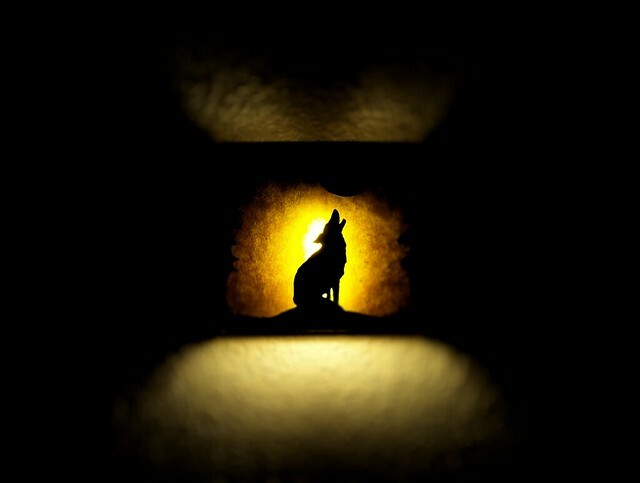 The wolf, that Lupa now knew as Shadow, said. His voice had annoyance swarming all around it, the atmosphere was now tense and Lupa could feel her lips pulling back and her toes curling. "If you attack my friends, you've got another thing coming..." She thought, Lupa didn't want any of her new-found friends being hurt but when she realised that the other wolf she didn't really know was being kind to this wolf she stopped, Lupa stopped her growling and covered her teeth back up. She looked back at Zara and beckoned her to come over before stepping forward herself. "I'm sorry for your loss, I'm sure he did die in honour. What he had was a serious thing not to be joked about." Lupa said in her normal, deep tone. "I'm Lupa, a new warrior for the pack, nice to meet you Shadow. And, if you don't mind me asking, who are you two?" She said to them, Lupa looked at the reddish one who seemed to be hiding himself away from the others. Addressed: Motomo, Zara, Kanaya, Shadow Mentioned: Topaz, Kazmir, Makoce, Kanaya, Mave, Shadow, Zara Word Count: 681 Notes Okay so even though I never got a reply to my last post it's been a while so I'll come here. There was a wolf next to her; Veri absentmindedly recognized that it was Makoce, apologizing for the pups. But you've done nothing... Go. The alphess couldn't bring herself to dismiss the female though, instead deciding to turn and force a smile up to the concerned packmate. "I'm no better than you would expect, Makoce. Thank you, but you've done nothing wrong. Please do your best to recover." The simple string of sentences clearly exhausted her, and rather than lay her head down and turn away, Verines neck muscles went slack and her cranium fell against the ground, her eyelids falling with it. The dismissal she presented to her pack was twisted together with heart-wrenching grief. Notes; Not my best, sorry. Keane forced himself to swallow most of his anger as Dido raised her eyes to his, her gaze searching his own. The aggressive and irritated twitching of his paws shifted into a new song of nervousness, and insecurities, though anybody unimportant wouldn't notice the shift in his emotions. He wondered if Dido was important enough to care. His jaw clenched visibility, and the silence was starting to get to him. Had she nothing to say to him? An apology perhaps? She deserves an apology from you just as much. Thinking this though, did not result in him spilling out words that begged for forgiveness. No, he remained quiet. More or less angry, insecure about himself and infuriating himself further with his lack of confidence. Keane didn't have to remain such a conflicted torpedo of emotions for much longer though, as Dido slid forward and hid her face in his ruff. Though he stiffened at first, slowly he began to relax every muscle, starting from Didos contact with him, and spreading throughout his body. "Don't be cross with me.."
Black lids slide over golden eyes, and his head dropped gently down to rest on Didos neck. The sensation of her breathing him in sent goosebumps throughout his body, and he trembled slightly with nervousness. I reek. I must reek. Canis I probably smell like vomit. Without thinking, Keane pulled away and shoved Dido out of the way, kind of harshly without the intention to come off as so. His ears folded back aggressively, but he was pissed at himself, not that anyone could tell. "I'm not upset Dido. Who was that guy?" His eyes were bright with frustration, his nervousness of not smelling like a flippin' angel getting to him. Thats such a stupid thing to be upset about gET AHOLD OF YOURSELF. A growl slipped out of his throat, and he again turned his face away from Dido. While he wasn't aware of how maniacal he possibly looked, he sure continued to act like it. His tail began to swish with pent up aggression, and he met Didos eyes again. "I saw you hit him; I can hit him too. Maybe you need to go on a walk?" By all means, Keane intended to be sweet, and caring. He meant to come off as concerned and compassionate, but ultimately came off as a volatile and probably threat. He continued to twitch softly, clearly angry to everyone but himself. Notes; This is super bad sorry. Makoce listened and watched her closely as Verine looked up at her, a fake smile coming across her face. Makoce tilted her head, confused. Done nothing wrong? I have done everything wrong. She thought. She didn't argue with the Alpha though; Makoce knew that it was disrespectful to argue with a higher rank. Verine lay her head down, a silent dismiss to Makoce. She simply nodded her head, and quietly walked away. A strange feeling came across her; it was almost anger, but leaned more toward sorrow and embarrassment. She suddenly felt like she should keep her mouth shut for as long as she lived. She didn't know what this feeling was called. It made her ashamed that she even spoke to Verine. She looked up and saw that most wolves were gathered around in one spot. Makoce shrugged, and walked over towards them. There was talk about death, but of someone Makoce didn't know. She was quite clueless, but nevertheless wanted in on the conversation. She found an empty spot to stand among them and occupied it, looking around at the wolves that she had not yet met. She recognized a few faces; she remembered seeing the oddly marked one with green eyes (Maverick) but couldn't recall a name. She thought she remembered the black pelted wolf (Shadow) from fighting the bear, but she wasn't sure. She was at a loss for words, and she just kinda looked among them. She didn't really want to talk or be talked to, out of fear of another social rejection, but she thought she'd give it another chance. 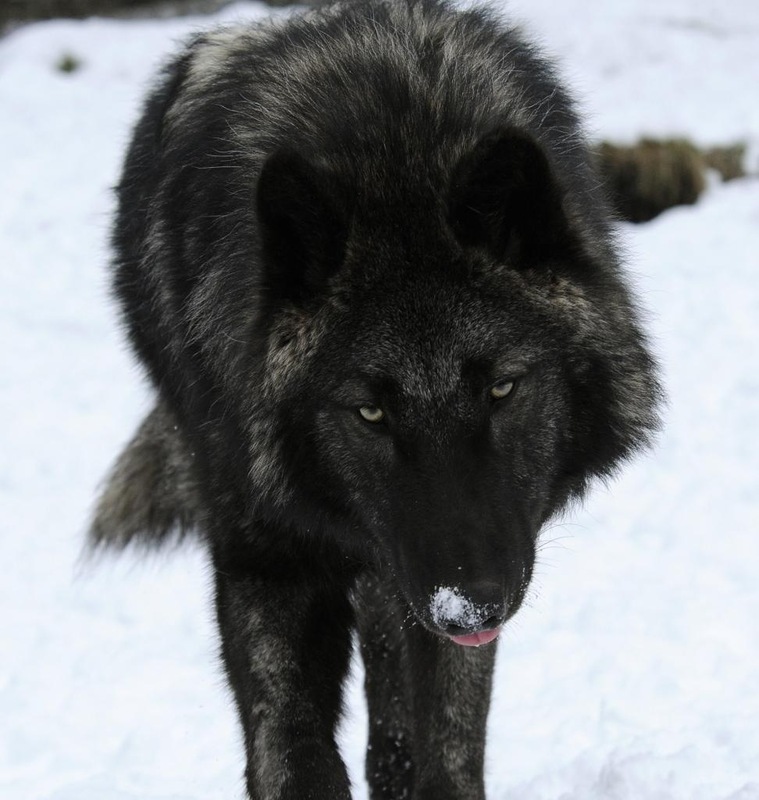 Motomo walked forward as a large, dark wolf came walking up to the group along with another darkish wolf with white markings over it's body. "I'm sorry for your loss, I'm sure he did die in honour. What he had was a serious thing not to be joked about." The dark wolf said, it looked female but sounded male. Her voice was deep and harsh and she obviously spoke in a harsh way a lot. "I'm Lupa, the lead warrior for the pack, nice to meet you Shadow. And, if you don't mind me asking, who are you two?" The wolf, now known as Lupa, asked. Motomo just stood there, looking at her as she spoke in such a harsh voice. He then stopped his staring and shook his head. "Nice to meet you, Lupa. I am Motomo. You can call me Mot, Mottie or Momo if you wish?" Motomo said to her with a very obviously put on smile. He just looked at her with that fake smile, not even showing much emotion. Motomo looked towards Shadow on the floor, he must've been pretty upset hearing the others talk about his brother, Dark, like that. "I'm sorry, Shadow." Mottie said, what else was there to say? He was confused. About everything. She knew a tragedy when there was one. It wasn't the smell of blood or bear that clarified her thoughts. It wasn't anything said or seen. She just knew;she could feel it;the heaviness in the air. Like something was missing. There wasn't happiness in this place. A heavy cloud of sadness lingered in the air, leaving a nasty taste in the she-wolf's mouth. She approached like a plague, slow yet swift. Observing. Should she approach and risk the wrath for stepping over pack borders and being too bold. She drew closer, nostrils flaring, ears erected and held high. Her presence here would surely dampen everyone's mood further;they've lost something special, and were grieving, some more than others. The wolves were being treated for their wounds. They were occupied;what wolf would gladly look upon Ophelia's presence and welcome her? Who would open their hearts to the stranger wolf and ask her if she'd like her join their family? No one would;but she couldn't back away. She'd made herself known. She blinked, slowly, inhaling quietly. The bear had clearly killed a mother's pups. She couldn't be angry at the bear;she was just like the bear. She stepped forward and fluttered her eyelashes. "Ciao.."((hello.)) She said at last, softly, gently, like a summer's breeze. He did not associate himself among the others. In fact, he wished that none would ever try. Just to be left alone, abandoned within the silence. Yes, that, that alone was a beautiful thing. One of the only beautiful and admirable things left. Heavy eyes blinked, his entire mass shifted over, ears twitching to the sound of a newcomer. He bid her no reply, but not that he had ever been addressed. 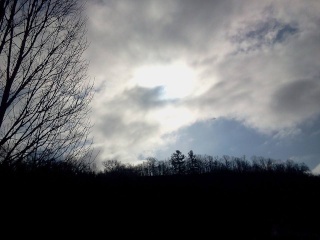 Sighing, his eyes shut, and the bodice wove among the grass, before it settled down, laying beneath the blanket of blue. Then, he delved into a world of darkness, as his lids shut. In the moment, he wanted nothing to do with the reality of the world. The following post is not suitable for weak stomachs, but is nothing that I haven't written when regarding Winter before. Be warned. Everything but the fragrance of him evaporated around her, the tendrils of Caros surroundings reaching out to her, calling. After having transitioned from delusions of her parents being the Alphas of Riadven, to the sudden realization that it was all mental images, to her frantically searching for Caro? The realization that he was present was enough to make her dizzy with relief. Winter moved slowly, tears rolling down her cheeks without realization. While her face was blank, her eyes were bright with terrifying, unreadable emotion. If anyone glanced her way, she'd be surprised if they didn't flee at the sight of her. Or, she'd like to think she'd be surprised; She was oblivious to her surroundings, as usual, caught somewhere between realities and the nightmares. Everything was blurred beyond comprehension, and all she knew was that Caro would be her tether to reality. As the male came into her vision, she slowed significantly, becoming almost clumsy with her movements. Her pupils zoned in on Caro, slipping up and down his taut body wrapped in fabrics of oranges, blacks and faded somethings in-between. Her periphial vision faded slowly into a muted gray, everything around him becoming fuzzy and casting him into hyper focus. To anyone observing from the outside, her slow, focused movements towards him would come off as creepy, and they were creepy. But, the beauty of her almost relationship with Caro was that he could accept her in all her mentalities. Though their interactions were far from romantic, or even friendly, they weren't aggressive either. They made her comfortable. Winter tumbled forward, eyes still on the wolf she hadn't yet made her full journey to. Her face fell against the ground harshly, her eyes slipping from her destination up to what he was glancing at. The shape and structure of this new child reminded Winter strongly of herself, with sharp, protruding angles and an air of something more than dangerous about her. But, all the same, she looked put together. With her gaze now centered on this smiling, beautiful female, Winter had the strongest urge to skin the stranger, an urge to shove herself inside the scalp of the female and pretend to be as stunning. Soft, gentle, and gorgeous words slipped slowly out of the strangers mouth, spinning around Winters ears like thread. They were foreign, and made Winter giggle loudly. A new toy perhaps? Along with an urge to crawl into her skin, Winter felt a compulsion to hop upon the girl and scream at her; Ride her and tell her that she was now under ownership of Winter Tolliver Saskia, make her as dirty as Winter was, both in her appearance and in her mentality. But while the thoughts gave her a thrill, they brought with the also terror, and confusion. Not once in her life had Winter experienced a lust of any sort... Of her own, at least. The memories of being victim to brutal lust sent chills up her spine, splitting the vertebrae as the freezing of her senses met with the sweat that broke upon her skin. A physical pain shot through her body and she shrieked softly, muffling it by forcing it into soft, shaking laughter. A smile was now spread across her face, and the streaks of earlier tears had dried up, leaving a faint discoloration due to the dirt and grime that had been washed away. She reeked strongly of an overgrown meadow thriving next to a toxic waste plant, but it did not stop her from coming within a breaths distance of the stranger with a pelt sewn of silk. "Cow." Winters head tilted to the right, her eyes glittering with pride. Indeed, she was unaware that she had spoken of a bovine, rather than echo the Italian greeting of Ophelia. "Nice to meet you, Lupa. I am Motomo. You can call me Mot, Mottie or Momo if you wish?" The wolf, Motomo, said in response to her question. Lupa nodded to the wolf and looked back towards Mave and during that time she caught sight of a thin female she'd never seen before. Lupa wanted to meet everyone, she was so excited to finally be in a pack. Lupa waited for the other wolf to respond (Kanaya) before nodding and backing away from the group to go and see this new wolf. But Lupa realised quickly that she wasn't the only one that had some interest in the wolf. There was an orangy male looking towards the female that was a mix of different blacks and greys. Lupa walked around behind them, so not to be seen and listened as the wolf of interest spoke in anootherlanguage that Lupa sort of recognised, Italian. "Ciao.." She said but before Lupa could respond a wqhote wollf walked right up to this new wolf and spoke: "Cow." Lupa growled from inside where the bushes were, this wolf had done nothing, she was new. The warrior walked out from her hiding place, staring down the white female letting a deep, rumbling growl escape her throat. "Leave her be. She has done nothing to you." Lupa spoke in her deep tone, it was harsh like a spear stabbing you. She didn't take her eye off of the wolf and she raised her tail over her back, Lupa's teeth were beared and eyes widened. She was being aggressive and all over a female she had just saw. He had seen her before he could smell her. Her drunken walk, arriving before her mind did. Plate lifting, a part of him was frozen with surprise, since his eyes had gone so long without being privileged to hold her within them. Her marred body, ghost like, crumpling beneath itself, yet still in tact. Pools, dribbling their tears, Caro's heart began to turn once again at the sight of them. Then he saw her eyes hold him. For a moment, nothing else remained alive. Something in his chest woke. Automatic, as though a button had been pressed. Once wanting to be dispatched from reality, his entire world sunk beneath his digits, and with a hurting thought, things before him jumbled. Then, her eyes were gone. Her attention captivated elsewhere, to a creature that Caro had forgotten. His eyes never left her figure, as she seemingly stumbled over. His legs were taut and powerful, he glided himself over within a few gaits, and he paused, feet from the scene, the word that left her pallid lips, ringing in his own ears. He then grew completely still. Remaining so, nothing broke his trance, he studied the female's before him, with eyes that were desolate to strangers and to ones that didn't know him. Except, only one within his proximity, not only knew of him, but understood him. His thoughts spoke for him in place of his words. Satellites tilted curiously, in a manner uncommon to his bodice. Then, another wolf arrived, an individual, whom the healer had never met. She came forward, her ebony fleece blocking a part of his view. Then the ebony creature growled, arching her tail over her spine, words meant to be of help within the day. He listened to her words, before suddenly he came forward, arriving within the center, staring upon each one. Yet his eyes remained on Winter's the longest. "Are you mocking her?" He then spoke, his words read both as a statement and then interpreted as a posing question. He gave a small sigh, his expression foreign, as he stared at the scarred female. "It makes me sad," he began, his cold voice suddenly more raw, "that you would come here and speak to her first and completely ignore me." The words, the way his tongue fastened them, and the voice delivered them. The thought of her hearing them, of being with her. Something in him ached then. "How long has it been?" he questioned, "Do you really value her time over mine?" His words and actions, were strange, his temperament a flurry, something he didn't understand himself. He was not angry, but he was not content. Then he turned towards the one who had greeted them, with a tongue he had scarcely heard. His eyes looked at her own, studying her. Then he came to a conclusion. A pretty creature indeed. However, a beauty captivated his attention instead. He released a snort through his nostrils, turning back towards his closest companion within the pack, his chest swelling with a bit more air than normal, his breathing, strangely becoming uneven. "Do you know the hell I've gone through without you?" "You torment my mind and heart," he stated such things as though they were the most obvious thing in the world, "Don't I at least get a hello?" There was a prickle of some sort, the closest thing to an offense. It could not be read and heard, but he felt it come alive. The negative emotion made him lick his lips, and he turned to the one who charged forward in defense. "You assert yourself as though you are dominant, and she is subordinate. Yet what you lack of is the knowledge to understand how to distinguish individuals." His voice was monotone, "Just because you appear with salivating lips and heated words, doesn't mean anyone will cower. Trying to fight aggression with aggression, will only lead to war." A shuddering breath forced its way into her lungs, expanding her chest and once again drawing attention to the sickly definition of her rib cage. Yes, she was quite a monstrosity. Immediately, Winter was aware of another wolf coming up onto her. Winter had not yet had a chance to meet this apparent member of the pack, nor did she want to with the actions that followed the females approach. "Leave her be. She has done nothing to you." But I did nothing! I said the same thing she did! A pouting look swam up on her features, as Winter was still unaware that she had spoken of bovines rather than greetings; She had been so proud till this strange wolf, asserting herself as if she had the right to, began to attack her fragile mentality. A muffled shriek slipped out of Winters lips and she leaned forward, squeezing her eyes shut and folding her ears back in order to escape from the terror she was facing. Her chest began to throb painfully, the aggressive thudding of her heart speeding up exponentially and creating a burning sensation that followed with an urge to claw her own heart out. But after moments, Winter found herself to be angry. She had been trying, so, hard! This stranger who had caught her attention was the first person, besides dear Caro, whom she had been halfway friendly with for the entire duration of her time at Riadven. Winter spun around, crouching down and spreading her lips over her teeth, her aggression morphing into a mad hatred for this female who thought herself better than Winter. Her tongue flicked between her canines, a rumbling growl building in her throat, volume and intensity increasing much like her frame started to slowly rise to above this ebony counterpart of her. Spreading her paws, Winter looked down at this new member of the pack, a frenzied fury glowing in her eyes as she snarled, spittle flying off her jowls. "Are you mocking her?" Winter flicked her eyes from the ebony female to Caro, dear dear Caro. Obviously, he would hold her attention longer than some pest with misinformation of authority possessed would. Winter shook her head in response, denying the accusations against her. After all, she hadn't intended to do anything wrong; Why wasn't it obvious to everyone else? "It makes me sad," There was an audible transition in his voice, the typical familiar frigidness of it morphing into something with a bit more emotion. "that you would come here and speak to her first and completely ignore me." But I wasn't ignoring you... Distracted. She distracted me... Winters guilt projected onto Ophelia, the stranger absorbing all of Winters current hatred and naming itself blame. It was unfair of Winter to blame the beautiful stranger, but Winter was insane. She didn't care about fair VS. unfair. Winters thoughts went unheard though, instead leaving her caught in a chaotic mess of confusion that she hadn't felt for a while. The only sound one could decipher from her was a terrified squeal, drawn out and low to the ears of those around her. It must have been strange, to see the shifts in her emotion; Indeed, she was dangerous. That anyone would willingly approach her was a shock, but of course it would be the uneducated newbie foolish enough to make that mistake. After all, everyone else at Riadven knew she wasn't exactly one to speak with, let alone acknowledge. She was an embarrassment fit for destroying legions of armies, or herself. Perhaps both. Winter cringed visibly at Caros snort, her body flinching away from him, only to jerk away from the proximity of the two females about her as well. "Do you know the hell I've gone through without you? You torment my mind and heart," There was a desperate undertone to his voice, trembling with emotion. "Don't I at least get a hello?" It was then that he dropped her, instead turning to the nameless ebony female of the pack. His words were harsh, but devoid of all emotion, as if Winter herself was the only one who deserved to see or hear such things. "I WAS NOT BEING AGGRESSIVE!" Finally, the words clawed their way out of her, her voice deep with fury. Winter pulled herself up from her crouched position, lunging forward to snap towards the aggressive female that started the whole thing, leaving her untouched for Winter only wanted to flee and pretend to be strong. Her eyes collided with the stunning strangers, her lips rolling with the growls that split her eardrums. Caro or not, she ran. Aggression and emotion left behind. Caro wondered where her destination was. Then he remembered the last time she had run. When she had run and never considered stopping. The underlying memory, brought forth a jolt of fear. Although it was unreadable through his bodice, and his orbs flashed an irritated look towards the two females, before with a confused mind turned and trotted after the fleeing figure. Halfway to her, he stopped. Standing there he pondered himself. His feelings, his goals, his plans, and his thoughts. Caro wasn't sure why he was doing what he was doing, he didn't even know if she would want him to follow her. Yet, a magnetic pull forced his feet to move again, and his gait turned to a lope, as he pulled himself through the trees, chasing the white fleece. He was a foundation for her, therefore he would follow her always. She had to know, that he wanted to be the one she would run to in times of fear and uncertainty. Addressed: No one in particular. Notes: Running through the trees xD What a peculiar thing. Lupa watched as the orange male walked over, he circled her until she became more dominant in stance and dropped his ears. "In fear or shame?" She thought, not really wanting to know but then again it could've been important. Lupa watched the move of each wolf she could see but remained with her teeth bared for she wasn't going to let there be any more death from now. The warrior may not of cared about death much but this wolf, whatever it's history, deserves to be in the pack just as much as Lupa does and if Lupa deserves Lead Warrior then this wolf deserves a chance. "Are you mocking her?" The wolf asked the white one. Lupa stood there, listening as he said many things to her. Becoming jealous of the new wolf, by what it seemed, this other white wolf must of been the one he loved. Lupa knew love was a potent thing, sending even the bravest of people to do wrong. "You assert yourself as though you are dominant, and she is subordinate. Yet what you lack of is the knowledge to understand how to distinguish individuals. Just because you appear with salivating lips and heated words, doesn't mean anyone will cower. Trying to fight aggression with aggression, will only lead to war." The orange wolf said. Lupa changed no way in her appearance and didn't look at all fazed for the wolf had got it wrong, Lupa was not being dominant at all. She was only being aggressive because a wolf had walked up to a newcomer and called her a cow. Not a pleasant thing. Instead of looking fazed a laugh escaped Lupa's mouth, she was amused by is poor attempt at reading her. "I was not being dominant, nor did I try to be. I don't mean for cowering, I mean to get my point of 'I will attack you' across because I will if that's what it comes to. This wolf did not deserve such rude words from you, she was obviously new here. I don't care if this brings war, I am a warrior, not a tracker or a healer. A warrior." Lupa said, her tone in its normal harsh way. "I'm willing to pin you down if that's what it takes to spare this wolf's life. I will not take one but I will stop another from being taken." She finished just before the white wolf yelled. "I WAS NOT BEING AGGRESSIVE!" She said as she lunged towards Lupa making an obvious attempt to look aggressive. Lupa stood there not giving a care in the world as the other wolf left, the male. She watched as they ran and Lupa turned to the female who spoke in the Italian tongue: "Are you okay?" Her words filled with kindness and compassion to the wolf and Lupa tried to comfort her. Addressed: Caro, Ophelia, Winter (briefly) Mentioned: All of the above Word Count: 745 Notes: Not as good as I'd of liked but ran out of time. HI EVERYONE. First and foremost, I'd once again like to congragulate you on your ascension into a lead rank! However, I'd like to gently remind you that you have not yet been promoted in the roleplay, therefore you'll have to wait before you can actually cite it in your posts .3. You can continue to be aggressive, but in the future I would refrain from letting Lupa think of herself as a Lead until one of the alphas tells her so ^^"
Ophelia was at a loss for words;her mouth dry and clamped shut. It had all happened so fast;too fast. She barely had time to respond;she barely had time to gather her thoughts and emotions before wolves, three to be exact, were upon her, though only the she-wolves seemed interested in her. The autumn pigmented male just seemed interested in the winter colored she-wolf; the one that had came to Lia's side first;the one that said cow. She was beautiful, the white she-wolf was, but there was a darkness to her that Lia recognized but couldn't identify. "Please.." She tried to speak, but her voice came out soft and quiet, and no one seemed to hear. She watched as the white she-wolf bolted away, and watched as the male followed. There was a bond between the two, and Lia missed that feeling. Missed having someone;when at last she was left with only the black she-wolf, Lia finally turned to stare at her, blinking. Frowning. Stoic. "Of course. Are you?" She replied shortly after, flicking her left ear as her nostrils flared. "Of course. Are you?" The wolf replied, she obviously spoke English then. Lupa smiled at the wolf who seemed a little shaken up by the whole ordeal. All the warrior wanted to do was comfort this wolf, she looked so thin and afraid. Lupa wanted to help her in any way possible, maybe she could fetch her some food or just stay and talk to her. She didn't want to get to close, to quickly just in case the wolf was insecure and didn't want Lupa to touch her. "Channel your inner kindness, Lupa, come on." She thought to herself as she inhaled a deep breath. Lupa then looked at the wolf, not in the eye so not to be intimidating, but not anywhere so it looked like she wasn't listening. "I'm glad you're okay. I'm so sorry if I made you jump but that wolf had no right to say what she did. I'm Lupa, by the way, if you don't mind me asking, what is your name?" She asked, not wanting to sound rude. Lupa then added on: "If you're hungry I can grab you something to eat! I wouldn't mind, I'm happy to do anything really." 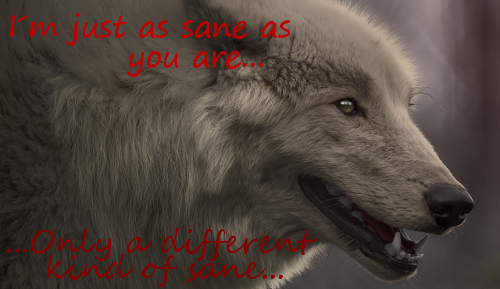 Her words full of kindness and showing how genuinely she meant it, Lupa wanted this wolf to know she wasn't just being sarcastic, she was being truthful and was willing to do anything at all. This wolf seemed nice enough, "A new friend maybe?" Makoce's nostrils flared. Two familiar scents overcame her, and her hackles raised at the very smell of them. Makoce stayed quiet though, as before she could say a single word, drama unfolded. Seemingly undetected, Makoce watched. Everything. From the way Winter moved, to the way Caro got caught in confusion and new emotions, the silencing way the two met, the closer they got to each other, it was almost as if space began to bend. They had a strange relationship; Makoce was jealous of this. Of all relationships, really. She was unskilled in this subject, and though she learned as she observed relationships such as theirs, it made her angry that she did not have such a thing, with anyone. She listened as words spat from between the four wolves, apparently the other two were newcomers, or Makoce had simply not met them yet. Makoce's nose scrunched as the warrior jumped to conclusions, and she was interested in the way Wimter reacted. She jumped between fighting back with a burning fury, or emotionally crumbled before them. It made Makoce feel... Guilty. She was one of those wolves who spat back at Winter when she spat. But what if there was more to her? What if there was more to Caro? Makoce tilted her head as Winter ran, and Caro hesitated. Winter reminded Makoce of the part of herself that she hid from the world. The side that panicked and got confused, the side that did not understand. The side that ran, not expecting but somewhat hoping that someone, anyone, would save her. Makoce understood now. Makoce shifted her attention to the warrior as she addressed the other female. A sharp pain shot Makoce's chest, and suddenly she was irritated with the warrior. Did she not see that Winter may be drowning? "And what about you? Are you sure you're ok? Because it doesn't seem that you can see clearly. Are you blind, my fellow fighter?" Makoce knew the looks of a fighter. This female was either a guardian or a warrior, but she kind of assumed she was a warrior, simply going off the fact that she was not afraid to fight, whereas Makoce's job was to fight a direct threat to a particular group of wolves, like the pups. But words escaped her maw before she could even think about them. Makoce swallowed once, surprised at herself. Normally she thought before she spoke; hence, her clever comebacks. But this time, she spat her instinctive anger. This wolf probably was either equal or higher rank than her, but her logic was not involved here. She wanted this wolf to see her anger. So Makoce did not hesitate. She kept going. 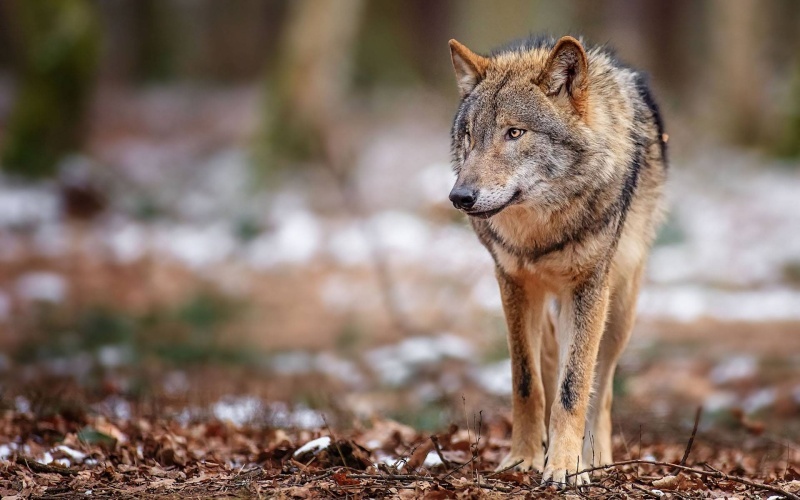 "I don't know how long you've been in this pack, but I've been here long enough to know that that female you were aggressive to - Winter, her name is - is not what her surface suggests she is. She is drowning, don't you see? In what, I am unsure, but don't hold down a wolf that is drowning. You say you will go to war to spare a wolf's life. That is honorable. But you'd better know who your enemy is. Don't be drowning your packmate to save an enemy." She finished her sentence, and watched the warrior for a reaction. This was odd for her. She was not usually so directly irritated with a wolf. She always covered herself in sarcasm or didn't say anything at all. She was especially surprised that she was defending Winter, whom she disliked. Have you become a hypocrite, Makoce? She flicked her ear at the thought. Or have you become a friend of Winter's? Notes: Agh. Weird Makoce is weird. And confused. "And what about you? Are you sure you're ok? Because it doesn't seem that you can see clearly. Are you blind, my fellow fighter?" A voice from behind her said. Lupa huffed, not really wanting to get angry right now in front of a new wolf that, in reality, already looked completely confused. She turned around to face the wolf who sure did look like a fighter except the way she walked was not one of a warrior, her feet placement would be incorrect, but what was she to know anyway? Different wolves have their preferences so Lupa just stayed neutral in her actions. "I don't know how long you've been in this pack, but I've been here long enough to know that that female you were aggressive to - Winter, her name is - is not what her surface suggests she is. She is drowning, don't you see? In what, I am unsure, but don't hold down a wolf that is drowning. You say you will go to war to spare a wolf's life. That is honorable. But you'd better know who your enemy is. Don't be drowning your packmate to save an enemy." She finished, pointing fingers towards Lupa. She could tell this wolf, Winter, was not as she seemed on the outside but it didn't matter for she was not going to fight for a packmate throwing insults over an innocent stranger. She'd rather fight for good than the rude. "So you think I started it, do you? You think I would start on someone I could see was unstable? No. I simply told her she shouldn't have thrown insults at this wolf and the orange one got aggressive first. I used an aggressive stance to show I meant it." Lupa replied her voice just as normal as ever, she didn't care what this female had to say, Lupa just cared about this new wolf who seemed to need food. She wanted to help and talk to her, just as she had came over to do. Lupa looked at the female who came over, making it very obvious she was not interested in doing this. It was dark, it was silent. She could only perceive the common noises of the woods, the chirping birds, a few tiny creatured running around here and there, yet no voices would pierce her eardrums. She was alone, as she was always. Banned, lost, with no real destination. Where was she going? The snowwhite fae could not tell. She was heading straight to the dark yet this was the only thing she could do. Without eyesight, she was doomed, yet she was still alive if it wasn't to her sensitive nose and hearing senses. She'd be dead by now if she didn't had this excellent gift. Not know what to do, Serena started to panic slightly, her breath heavy as she froze on spot. This was such an unknown feeling. She was afraid, what if they already noticed her and weren't too pleased about a stranger roaming within their territory? They'd cut her throat and rip each of her ribs out. 'They could kill me. I wouldn't be able to defend myself. They would kill me and justify themselves with the fact that I'm blind and couldn't survive in the wilderness either way.' Shaking her head vigorously, she growled slightly at herself. 'Shut it, Serena. They haven't noticed you. You'd be dead by now if they did. You have to show yourself to them before they think you are an intruder. Show them that you mean no threat.' Nodding at her words, the fragile fae slowly arose, continuing with her slow walk, heading towards the location of the scents. Now she could hear them. Silent voices which grew in sound each step she took. Without even being that close, she could already identify their words. Whatever was happening did not sound too inviting. Out of sudden, a loud, hostile scream of terror echoed through the forest, causing Serena to yelp in fear as she tucked her tail between her rear legs. It sounded frightening, intimidating. Her entire body was shaking, this situation was new and she was unsure of her decision. Was it the right thing? It was too late to leave as she almost reached the camp site and could easily be detected. 'Breathe.' She commanded within her thoughts and her body obeyed. Breath in and out. Now, more in a relaxing posture, she placed her off-white paw upon the clearing, the rest of her body following as she exposed herself to the wolves in front of her. Her eyes were directed nowhere specific, she was staring at absolutely nowhere. What was she supposed to do now? She decided that it'd be better to wait for anyone to notice her presence. So she suit herself and lowered her body into a neat seat, patiently waiting for her destiny.